The Premier Plus Package - Join the 100 Club! An exclusive on-line offer, limited to just 100 packages on selected racedays during the season. This package is also limited to sales of 8 packages per individual. 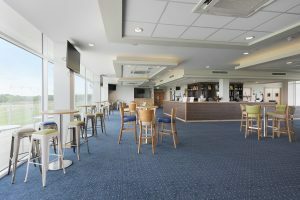 Premier Plus offers an upgrade to the Premier Enclosure which includes exclusive access to the New ‘1891’ Bar in the Millennium West Stand until a designated time (usually around the 2nd race). The package also includes a race programme, pre-race tipster talk, complimentary drink and Bistro brunch or lunch voucher. Scroll down the page for more information. Upgrade for the day and enjoy your racing in style! Premier Plus badge holders may gain entry to the ‘1891’ Bar as soon as gates open, which is generally two and half hours prior to the first race but no earlier than 10.00am. We encourage Premier Plus racegoers to make the most of their day and arrive early. 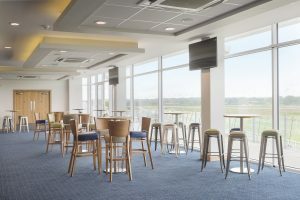 Premier Plus badge holders will have exclusive use of the suite up until a designated time (Usually around the 2nd race), after which time the bar will be open for all Premier admission holders to access. The 1891 Bar is located on Level 3 of the Millennium West Grandstand and is a Premier Enclosure facility. 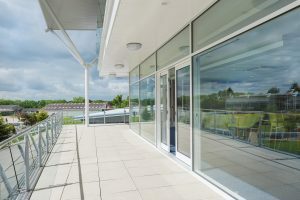 The suite offers fantastic views of the Racecourse and Winning Post and also overlooks the Parade Ring and Winners’ Enclosure. There is occasional bar seating provided but not on a reserved basis. A tote betting counter is located within the bar. The 1891 Bar has varied access dependent on the individual race fixture date. 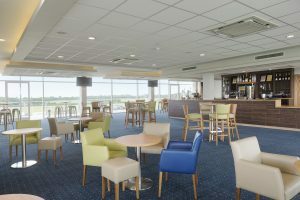 On selected racedays during the season, exclusive access to this bar for part of the day is included within our new Premier Plus packages. Please check the individual fixtures for more information. Premier Racegoers may access this bar after a given time. Information will be provided on the day. Premier Plus package holders will each receive a Bistro Voucher which may be redeemed in the ‘1891’ bar at any point between gates open and the start of the first race. There will be a small selection available on the Bistro Counter from which you may exchange your voucher. A vegetarian option will always be available. If you have additional dietary requirements please let us know in advance and we will be happy to provide suitable alternatives for you. Food will also be available to purchase from the Bistro on the day. Please note that reserved seating is not included within the Premier Plus package. There is seating for all, but you need to arrive in good time in order to secure the best seats. During our October to January fixtures we offer a fantastic bistro brunch menu. During our February to May fixtures we offer a bistro light lunch menu. A full Premier cash bar facility is available. A pint of beer, lager or cider, a small glass of house wine, a glass of prosecco, a main-line spirit and a mixer, a freshly percolated coffee, or a Yorkshire specialty tea. Wetherby Racecourse reserve the right to make changes to our menus at any time. From time to time we may include a themed or seasonal variation to the menu and/or the drink. Please check the menus on the bar on the day. Please note that there is no reserved seating with this package. The 1891 Bar does have more seating than the sales limit of the package. Arrive early to secure yours. Qu: Is there a dress code for Premier Plus? No, Wetherby do not operate a formal dress code within any of our enclosures. We advise smart-casual dress and also advise our racegoers to dress for the weather! Qu: Will I get a seat in Premier Plus? There is no reserved seating offered with this package. The ‘1891’ bar has a variety of soft seating and high stools around small bar tables & high poseurs. There is more seating than required for the 100 packages. It is likely that small parties will need to share a table with other guests. While we don’t mind racegoers moving chairs to suit, we do not allow the movement of tables within the suite. We would always advise that you arrive early to secure seats for your party, and to make the most of your day. Once the bar opens to all of our Premier admission holders it will get very busy. You may choose to stay in the bar after this time or you may feel you want to leave to explore other areas of the Racecourse. Qu: Can I upgrade on the day? We are hoping not as we feel the package will sell out in advance. 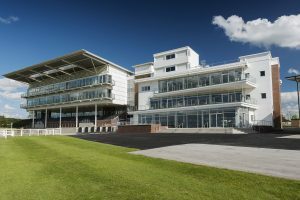 However should we have availability remaining, we will be offering a Premier Plus upgrade from Level 2 of the Millennium Stand on the day of racing. The upgrade will include your admission to the ‘1891’ bar only and will not include a racecard, or the included refreshments or drinks which obviously have to be pre-ordered in advance of the day. Standard Raceday £10.00 each | Feature Raceday £10.00 each | Feature Plus Raceday £15.00 each. Qu: What if I have a special dietary requirement? Book your package online and then drop us an email to let us know your requirements in advance of the raceday and we can make the necessary arrangements to ensure that your dietary requirements are fully catered for. We regret that we cannot guarantee to meet any special dietary requirements fully unless we receive notification at least 48 hrs prior to the race meeting. QU: Why can I only purchase 8 Packages? As there are only 100 Packages available we feel it only fair to limit the booking quantity to 8, in order that larger groups do not monopolise the space. The order quantity is limited to each individual purchaser. The seating within the 1891 suite is occasional and is not suited to larger groups who will want to be able to sit together and will not be able to on the day. QU: Can I take children into Premier Plus? Children aged under 18 are admitted free of charge into the Racecourse Enclosures and facilities when accompanied by a paying adult. The Premier Plus Package includes an element of seating, food and drink, which under 18’s who are admitted for free are not entitled to. Food and drink for under 18’s can be purchased in the ‘1891’ suite and we do have more seating available than packages sold, so there should always be a few spares. However if you are bringing children with you please be aware that you may be asked to relinquish seats they are using if our stewards require them for others. Due to the exclusivity of this package, if you wish to bring children with you and would prefer for them to have a guaranteed seat, and brunch/drink voucher then you will need to purchase a full-price package for them. QU: Is the Premier Plus Package suitable for disabled racegoers? Yes, lift access is available in the new Millennium West Stand and the lifts in the Millennium Stand will also get you to the ‘1891’ bar. The ‘1891’ bar has its own suite of toilet facilities including a designated disabled toilet and baby change. Wheelchairs are also able to access the ‘1891’ balconies. Please note that the concession for free entry for carers of disabled racegoers does not apply to the Premier Plus package as it is a discretionary concession which can only be administered at the turnstile by our stewards on the day. The majority of our seating in the 1891 Bar is on high stools, therefore we strongly advise that if in your party there is a disabled or elderly guest who may struggle to sit on this type of seating that you inform us in advance so we can reserve one of our lower sets of furniture for your party. We regret that without prior knowledge we may be unable to provide suitable seating on the day. QU: Where is the nearest tote betting to the ‘1891’ bar located? A tote betting counter is located within the ‘1891’ bar. The new tote betting shop is located 2 floors down in the Henry Crossley Bar. QU: Can we use the balcony in the ‘1891’ bar? Yes of course, but it is a non-smoking area (including of E-cigarettes). You may take your drinks in glassware out onto the balcony initially, but Stewards may restrict the movement of glassware outside at the 2nd race for reasons of Health & Safety. Plastic drinkware is available from the bar on request. The Premier Plus Package is limited to just 100 packages and is only available on selected racedays, so you need to be quick to book. We also limit each individual purchaser to a maximum of 8 packages. This offer is also only available to book on-line. We are sorry but we are unable to take bookings over the telephone for this package. Online sales dates are listed within the fixtures information.